The summer months make exercising enjoyable and definitely a lot more motivating, but as soon as the weather start to plummet we often just want to head inside in front of the fire and curl up. Unfortunately, this isn’t the best for our health or exercise routine. Exercising in the fall isn’t all bad, and can actually be a nice change compared to the warm summer months. The fall is the perfect time to ramp up your exercise routine with the holidays approaching, which can be perfect for your motivation levels. 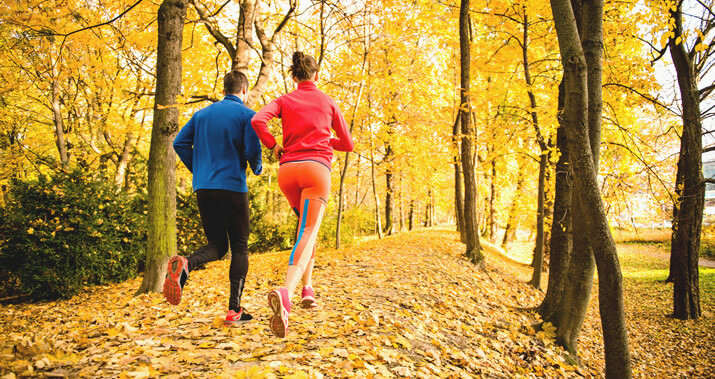 To inspire you to keep up your exercise routine in the fall, here are 4 tips to help. Fall weather, whilst a little colder is the perfect time to take in the scenery, colours and smells of nature. If you’re only a few blocks away from your destination, opt for taking a walk rather than driving. Once you start walking, you’ll not only warm up, but you will be so distracted by your surroundings that you’ll forget you’re even exercising. You could even carry around a spare set of shoes for if you choose to walk to or from the office. When the weather gets colder it can deter you from going outside, let alone exercising! But there’s an easy fix for this. Invest in some new, warmer exercise clothes and dress in layers. The new exercise clothes will motivate you to exercise more frequently, and keep you warm at the same time. Items such as gloves or a scarf work wonders in keeping you warm, and are easy to take off and carry when you start to work up a bit of a sweat. According to a study done by Harvard Health, a 155-pound person can burn 149 calories just by raking leaves for 30 minutes! By turning your indoor and outdoor chores in to a workout, you can burn fat without even knowing it. Put on some music, some workout clothes and start cleaning! If you really don’t want to go outside in the cold, or you have a few rainy days, why not bring your workout inside? There are so many fat burning exercises and workouts you can do from the comfort of your living room. Invest in a set of workout DVD’s or search YouTube for a workout that interests you. There are so many workouts available online that you can do in a small space, you just need to find what you like. Next Next post: How Optimity Helped Me Lose Weight!